Home BUSINESS NEWS Kiambu denies intent to disinherit land rate defaulters. Kiambu denies intent to disinherit land rate defaulters. Kiambu County Government has denied reports that it plans to reposes land belonging to residents who fail to pay their land rates. 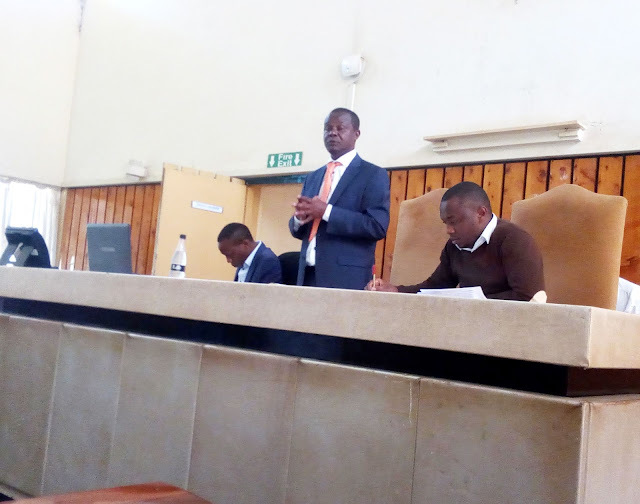 While admitting that the law does not allow them to disinherit those who defaulted on their obligation to pay rates, Lands, Housing, Physical Planning, Municipal Administration and Urban Development CEC Mr. James Mitambo Maina said that they had opted to use other alternatives such as offering penalty waivers in a bid to encourage more people to pay their rates. “We have no intention of disinheriting anyone’s land to recover rates arrears. However, we encourage all those who have not paid their land rates to do so through incentives such as waiving penalties for late payments,” said the CEC during a Public Participation Forum on land rates at the Thika Plenary Hall. Maina added that after listening to the public uproar over the increment of the land rates, the devolved government decided to suspend them and organise a fresh round of public participation to incorporate the residents’ views into the new rates. “As we stand, these rates have been suspended and we will revert to the old rates as we head to the process of degazetting them. However, there has been a lot of misunderstanding with the new rates as we had actually decreased the amount charged from the previous 0.75% to 0.25% of the value of your land,” he explained. He noted that the increase in the land rates had been necessitated by skyrocketing rise in the value of land within the county. “The value of a quarter acre piece of land in Ngoingwa previously was valued at sh. 288,000 attracting land rates at 0.75% then. Today, the same piece of land goes for sh. 2,160,000 but at the rate of 0.25%, we had charged them at for just sh. 5,400,” he said. The CEC admitted that the county government collected revenue from barely less than 50% of the private land ownership. “The value of private land in Kiambu County is worth about sh. 79 billion. Therefore, if everybody pays their rates at the proposed 0.25% of the value of their land, we will generate approximately sh. 1.7 billion. This means that we will be able to offer quality services to the residents of Kiambu County, consequently increase the value of such land significantly,” explained Maina. Maina clarified that the rates of land was calculated using the Undeveloped Site Value (USV) whereby the its value was calculated according to the value of property investments within its location. Responding to the CEC’s explanations, the chairperson Thika District Business Association (TDBA) Alfred Wanyoike commended the county government’s decision to suspend the new rates. However, he appealed to the minister to extend the 90-days notice for payment of these rates up to 30th of April as the confusion emanating from this misunderstanding destabilised many residents’ financial planning. He also challenged the county leadership to take recommendations by members of public seriously as their disregard to the people’s views was what eventually led to massive default in payment of rates and licenses. “One of the main reasons why people fail to attend such forums was because they take them as a waste of time. This is because they feel that none of their views are taken into account as the public participation forums are just PR stunts by the authorities who eventually do what they had planned to do without taking into account the interests of the people they govern,” said Wanyoike. Chairman of Peace Campaign and Community Policing Aboo Norein challenged politicians against using such forums to settle political scores which ended up being shouting match-ups between warring camps thus beating the logic for such platforms.